If you love Facebook-stalking through old photo albums on the site, you might be in for a surprise in a few weeks. McAfee and Intel are releasing a new Facebook application that will add additional privacy layers for Facebook photos. The app, McAfee Social Protection, will be available as a browser plug-in for Internet Explorer, Firefox, and Google Chrome for PCs at the end of August, with Mac, Apple iOS, and Android to be added by the end of the year, according to Mashable. The app will give users more control over who sees their pictures, and also prevent people from downloading pictures from Facebook. 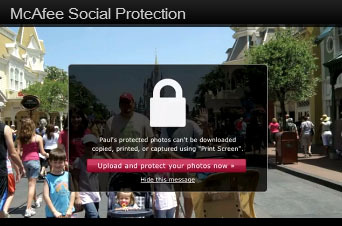 It will even prevent would-be picture grabbers from taking screenshots, displaying a padlock graphic if anyone tries. The plug-in also utilizes advanced facial-recognition software, so that if anyone puts a picture up on Facebook that looks like you without tagging it, the app will let you know. Only people you invite will be able to view your protected photos, and they will first have to download the plug-in themselves, a step that might deter the casual Facebook photo stalker. Browsing through old pictures is fun, but at the end of the month it might get a lot harder. Click here to view the ‘Social Protection’ Facebook app page and to sign up for a notification for when it becomes available. Social Protection will be released as a free public beta at the end of this month. McAfee hasn’t decided if it will be bundled with other products or if it will be a stand-alone offering.